For years, in his hours off from his job as a linotype operator at the New York Times, Leo Brooks (1905-1993) visited the city’s museums and galleries. He admired modernist work. At age 60 he took his first art class, at the Art Students League. 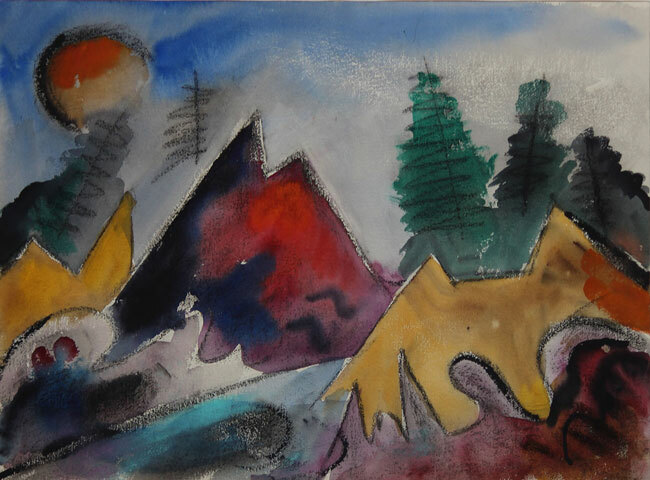 He loved the directness of watercolor and the freedom of a modernist sensibility, which allowed him to alter the forms and colors of a scene to serve his own aims and the structural needs of the work. His energy and devotion to his new-found passion increased upon his discovery of Monhegan, where he lived and painted for many summers. Brooks’ work is in the collections of the Portland Museum of Art, the Farnsworth Art Museum and the Monhegan Museum. Most of the ten works on display at the Jonathan Frost Gallery are newly framed and have never been shown. A charismatic figure, New York/Maine artist Leo Brooks “found” himself on Monhegan Island, 12 miles off the coast of Maine. He was an artistic man for many years, having been a photographer during the Great Depression of his early years, working for the WPA (Works Progress Administration) during that time. In addition, he had spent a good portion of his youth visiting the museums of his native New York City and even spent some time at the Art Students League later in his industrious life. As well as being an admirer of the arts since his youth, he had greatly enjoyed the outdoors as a young man. Both came to suit him admirably when, in his 60s, he took up watercolor and began visiting Monhegan during summers away from the city. His “loaded brush,” a brush heavy with water and pigment, became a hallmark of his colorful work. Representative in approach, he painted still lifes and landscapes and familiar activities such as the fishing that is the lifeblood of Monhegan, yet he was very loose and expressive in his treatment of these everyday occurrences, to the point of endowing them with excitingly abstract qualities. Even his nudes, in classical poses with island backdrops, had a dramatic flair that conveyed his excited nature when using brush and pigment, often on saturated paper, the better to disperse radiantly his expressive palette. Later in his life, long after he had retired, long-term illnesses began to take their toll on his quality of life and in 1993, at age 84, he decided to end his life where and when he chose. His work lives on, and is represented in the permanent collections of the Portland Museum of Art and the Farnsworth Art Museum in Maine, as well as in private collections on an international scale. Examples of his WPA photography are in the permanent collections of the Museum of Modern Art and the Metropolitan Museum in New York City. Friend of art and artists, Leo Brooks touched many with his works and is still actively collected, and missed, by many other friends of the arts today.